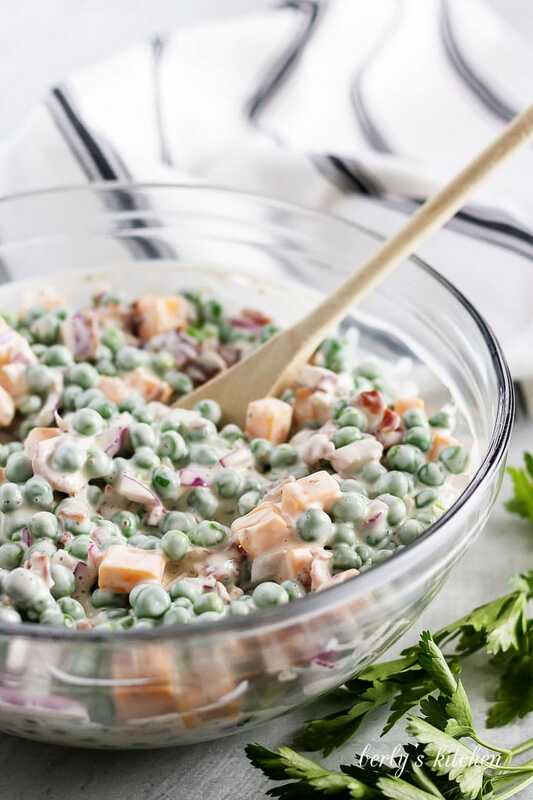 A tasty but simple green pea salad with bacon, and a mayonnaise and vinegar based dressing. 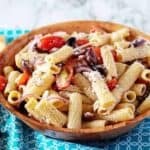 It’s the best salad for your next grilling get together! Thank goodness Spring is right around the corner. Warm temperatures, bright sunshine, and outdoor grilling. It doesn’t get much better than that. What’s better than sitting down, outside, to perfectly grilled meats? Nothing, that’s what I say. However, for every grilled burger or steak, you need to have something tasty to eat alongside it. Usually, I reach for a salad or grilled vegetable. This season, I’ll be partaking in this pea salad. It has everything I love in a great salad. 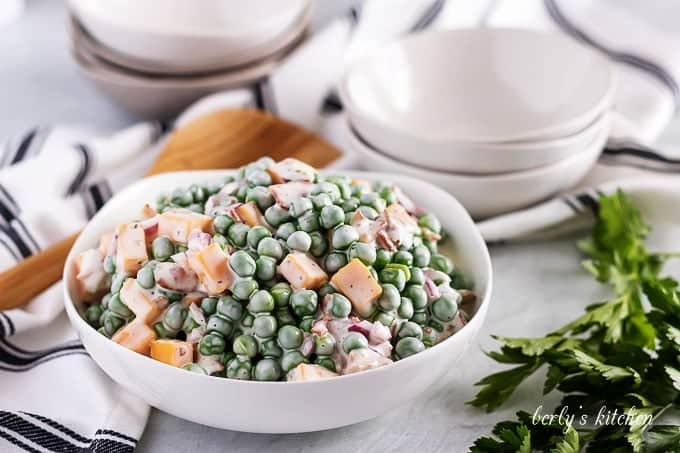 Bacon, cheese, onions, and of course, green peas! Marry that with a savory dressing and you have a match made it the heavens. 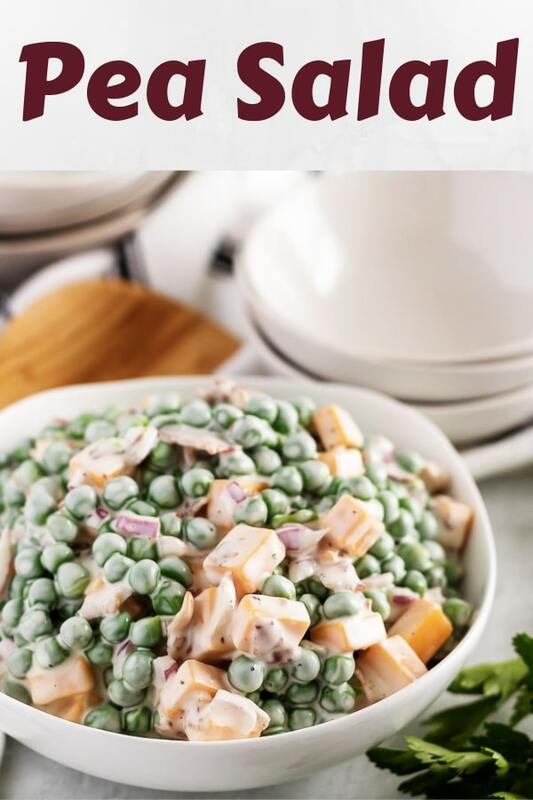 For today, I’m going to share our pea salad recipe. How ’bout we get started? Once again, we’re making an easy recipe. Seriously, once the bacon is crumbled, the onions diced, and cheese cubed. You’re basically done. Kim cubed the cheese and cooked the bacon herself. In spite of the extra steps, I still think this pea recipe came in under fifteen (15) minutes. The main thing is that you get the frozen peas unthawed. You can pull them out and put them into your fridge the night before, if you like. Otherwise, take a look at my tips for a quick way to unthaw veggies. Once you have the peas thawed out, the cheese cubed, onions diced, and bacon crumbled, toss them all into a medium sized mixing bowl. After that, in a small bowl, combine the mayonnaise, vinegar, sugar, salt, and pepper. Use a whisk to break down all the mayo. 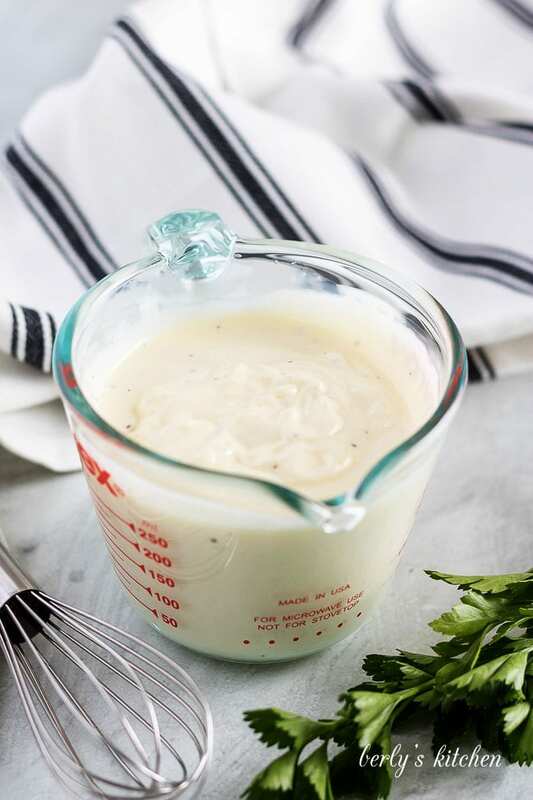 That way, you have a smooth and creamy salad dressing. The only lumps in our pea salad should come from the peas. When the dressing is done, slowly drizzle it over the other ingredients in the bowl. Use a spoon or rubber spatula to toss the salad. That’s it, you’re green pea salad is done. On the chance your not eating it right away, go ahead and refrigerate it. Room temperature mayonnaise is bad for the tummy. Just saying. Kim and I hope you enjoyed the recipe and wish you all the best! For the best results, remove your peas from the freezer about a half an hour before you get started. 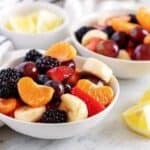 Place them in a bowl filled with water so they can unthaw. Make sure the frozen green peas are well drained; otherwise, the dish will be watery. If you desire a salad with more dressing, simply reduce the amount of peas to one (1) pound. On the other hand, if you want less dressing, increase the amount of frozen peas to two (2) pounds. Another way to save time is buy pre-cooked bacon and microwave it until it’s nice and crispy. Then you can let it cool for three (3) to four (4) minutes before you crumble it into small pieces. Growing up, we used Miracle Whip a lot. As a result, I got used to eating it in many of our dishes. 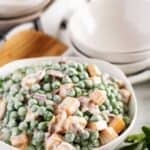 If you want to add a sweet, tangy flavor to the pea salad, then try using that instead of mayonnaise. If you enjoyed our green pea salad recipe, please leave us a comment and rate the recipe card. You can also find us on Facebook, Pinterest, Twitter, and Instagram by searching for Berly’s Kitchen! 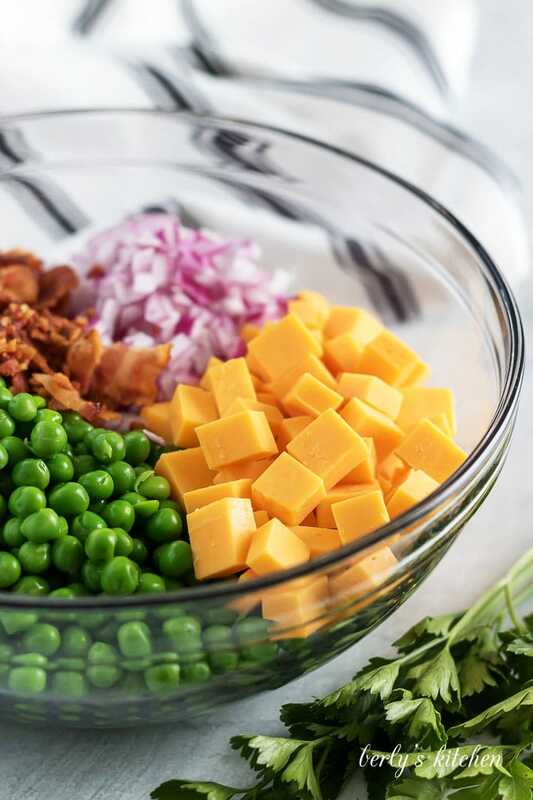 Place the peas, bacon, cheese, and onion in a medium bowl. In a separate small bowl, combine the mayonnaise, vinegar, sugar, salt and pepper. 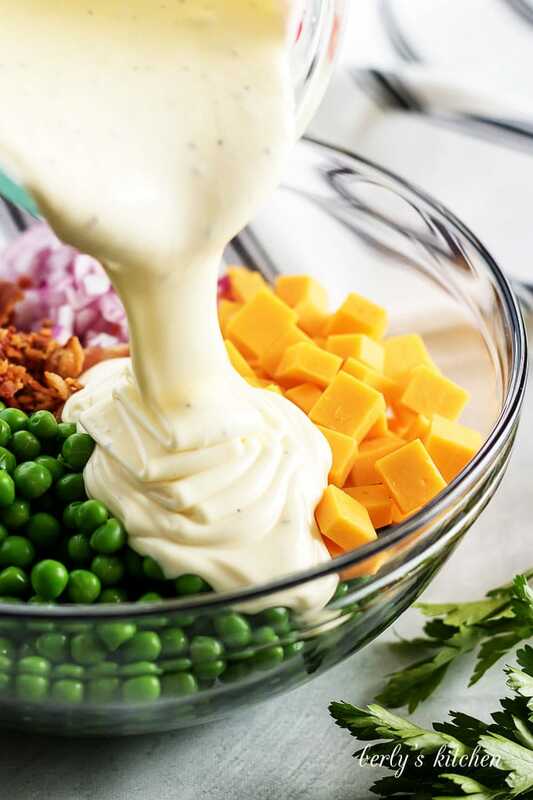 Pour the dressing over the peas and other ingredients. Stir to combine. Serve while cold. The calories listed are an approximation based on the ingredients and a serving size of half a cup (1/2) of pea salad. Actual calories will vary. 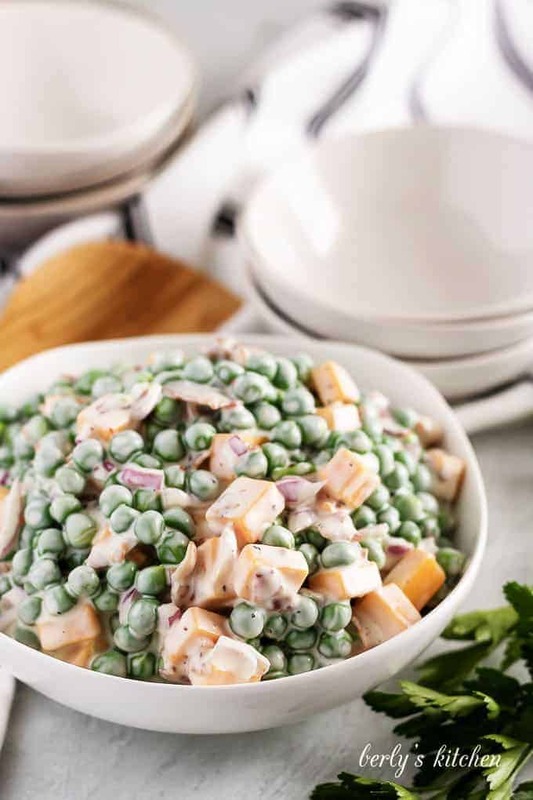 The green pea salad can be stored in your fridge for up to three (3) days.